Brushed Aluminum frame fits in with any setting. 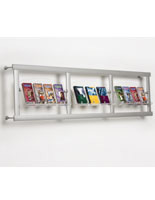 Wall-mounted literature racks give you more floor space. (3) Green-edged pockets look like glass but have durability of acrylic. Display sticks out from wall 7". 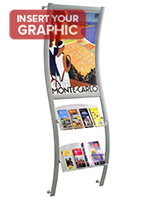 These leaflet displays are perfect literature racks for welcome centers, showrooms, and any other locations needing to supply passersby with information. 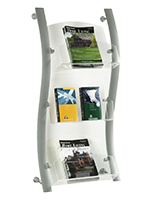 These literature racks have (3) acrylic pockets. 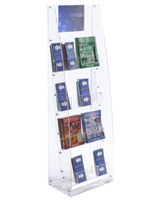 These pockets are green-edged, presenting your publications in the elegant style of glass, but with the lower cost and added durability of acrylic. 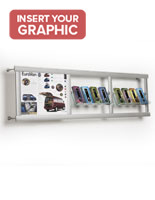 These wall mounted brochure displays, literature racks use adjustable brackets with these shelves, allowing you to move them to any height and angle you need. The (3) pockets give you plenty of space to place multiple brochures, ensuring your visitors can get any information they need. 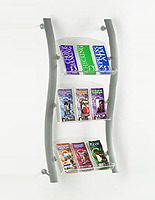 Literature racks are made from brushed aluminum. Brushed aluminum is solid aluminum with a sleek silver finish that will match any décor. 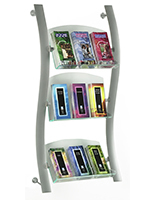 These brochure holders, literature racks are rust-resistant when used properly indoors. 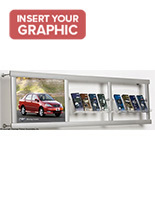 The wall-mounted design of these brochure holders frees up floor space in your marketplace. 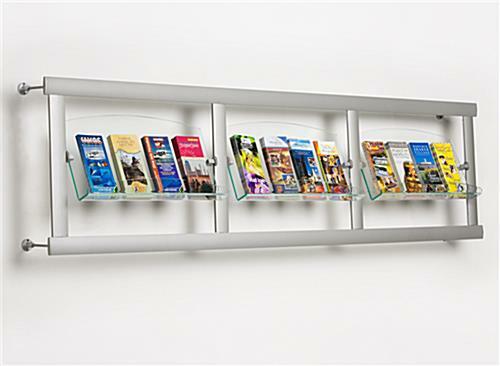 Brochure holders, pamphlet stands and other literature racks are a convenient way to display literature to visitors, and the wall-mounted design makes this a must have for any location seeking to maximize selling space! Please Note: Wall anchors and hardware are not included. 77.3" x 21.5" x 7.0"
22.0" x 13.3" x 2.5"